When I was at Hampi this is what I felt. Recently, we drove to Hampi on a bright Saturday morning. Until we reached Shimoga it was a pleasant trip. From there the road was under repair and it took longer time than the required time to reach Hampi. There was not even a shop on this bumpy road, and we hoped we could see some shops and restaurants once the work is completed. We had booked our accommodation online in Clarks Inn and as soon as we reached there we had some food. Without taking some rest, we decided to visit the Hampi ruins which I had been thinking for a very long time. According to History, the city of Hampi was the capital of the Vijayanagara Empire that flourished in the14th and 15th century. Today, Hampi temple town is known as Humpi ruins, scattered over kilometres of rugged terrain. Hampi is recognised as a UNESCO World Heritage Site for Group of Monuments and it is a destination which attracted travellers from around the globe. Situated on the bank of holy river Tungabhadra and rocky granite cliffs on other sides, the town of Hampi is a spiritual place, dotted with numerous ruins of temple complexes of the Vijayanagara Empire in Bellary Dist of Karnataka State. 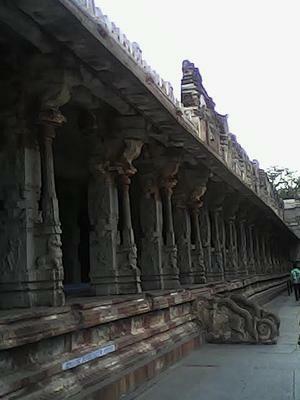 Primarily, the whole Hampi is divided into two parts – The Sacred Center and the Royal Center. You can see vast stretches of boulder-strewn hills and among them lie some of the main places of attraction like Virupaksha Temple, Vittala Temple and the Stone Chariot, Elephant stables, Queen's Bath, Mahanavami Diiba, Krishna temple, Lotus Mahal, Hazarama Temple, Zenana Enclosure and Archeological Museum. 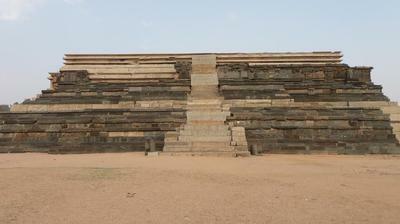 They stand as a testimony of the royal grandeur of Vijayanagar Emperors of India. Rubies and diamonds were believed to have been sold on the streets and gold and silver were used currency. Standing on top of the stepped tank, when our guide was explaining to us how water was purified and stored at that time I was amazing at the scientific marvel of our ancestors, centuries ago. Hemakunta hill. 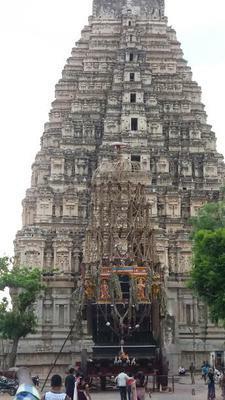 When we reached Veerupaksha temple, the guide said that it was the only temple where still daily pooja is performed. This temple has shrines of Lord Shiva and Goddess Pampa and River Thungabhadra gently meanders behind it. When we entered inside we saw people waiting for the elephant to be blessed for a small fee. After the pooja, through the beautifully carved halls, the guide took us inside to a little room where an inverted shadow of the Gopura is visible, a wonderful technology used by our ancestors. For a few moments, I was making an unsuccessful effort to visualize how the whole town was like during the glorious period of Vijayanagar Empire with these amazing structures and bazaars. No doubt it is a great place not only for the travelers but also for the photography enthusiasts and the architecture students. One can walk around and see all the places even without the help of a guide, but a guide can provide you with the details of each structure. Since we were pressed for time we hired a guide who was good at explaining everything and took us to the right places which we were eager to see. 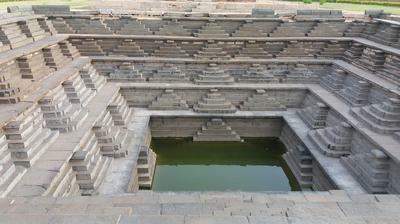 Hampi is not a place to see in one or two days, it may take more than a week to see all the ruins. It depends upon your taste and the time you have in your hand. Our guide wanted to take us to more places, but we were too tired and wanted to have some rest and kept it for another trip. Since the Archaeological Museum was located just in front of the hotel where we stayed, we visited there comfortably. It is 4 km from Hampi Bus Stand. The museum has four main sections. The first one is for the model of Hampi valley, the second one for sculptures and idols, the third one for tools, arms and coinages, and the fourth section for hero stones of pre-historic settlement. It was very sad to notice some of the idols and sculptures with broken head, destroyed by the invaders. On our return, we preferred to take another route which was a bit longer route through Bellary, but the roads were excellent and the journey was most enjoyable.